Jawaharlal Nehru, while adopting the cakra for the Indian national flag, famously described A’soka’s reign as an ‘international period’ in Indian history. This book Studies the diverse legacies of A’soka’s rule in India and the world. Written in light of advances made in archaeology, epigraphy, and numismatics in the past half century, these essays are linked by three underlying themes. The first discusses the best-known monuments of A’soka—pillars and rocks that bear his inscriptions. The second examines the interconnectedness of the edicts, their monumentality, and the role of Buddhism in the different concept of kingship they conveyed. The third analyses the making of the cultural memory of A’soka and raises pertinent question crucial for understanding the relationship between the past and the present. Replete with photographs from various A’sokan sites, these essays by prominent scholars from across the world outline the importance of A’soka not only for the Indian nation-state but also for the entire Buddhist world of South and South-east Asia. Moving away from conventional periodization of Indian history, the book raises important questions on the beginning of history and archaeology in the modern period. It examines the extent to which nineteenth century initiative have affected the study of A’soka and his reign. This volume is the result of an international conference 'Asoka and the Making of Modern India' held at the India International Centre, New Delhi, 5-7 August 2009. The only paper in this volume that was not presented at the conference is the one by K.R. Norman, who was unable to attend it due to health reasons. The conference was sponsored by five institutions: Department of Asian Studies and South Asia Institute of the University of Texas at Austin, Centre for Historical Studies of Jawaharlal Nehru University, Indian Council of Historical Research, American Institute of Indian Studies, and India International Centre. To all of them we owe a debt of gratitude. Participants included scholars from India, USA, UK, Germany, the Netherlands, France, China, Korea, and Thailand. The logistical complexities involved in arranging an international conference of this magnitude meant that it could not have been the success that it did without the generous assistance of numerous persons and institutions, both in India and in the USA. We thank them all, even though they are too numerous to be mentioned here individually. There are a few, however, to whom we owe a special debt of gratitude: Sabyasachi Bhattacharya, Chairman of the Indian Council of Historical Research; Kapila Vatsyayan and Premola Ghose of the India International Centre; Purnima Mehta, Shubha Chauduri, and Vandana Sinha of the American Institute of Indian Studies. The conference had two major foci: the ongoing reassessment of evidence relating to Asoka and the consideration of his significance in historical memory. We want to thank especially the scholars who presented papers at the conference, and without whose active interest and significant research on numerous aspects of Asokan studies this conference or this volume would not have been possible; and also the distinguished chairpersons of the panels: Joel Brereton, Lokesh Chandra, Rajat Datta, Oliver Freiberger, Klaus Karttunen, T.N. Madan, B.M. Pande, Shashi Joshi, R.C. Agarwala, Martha Selby, K.M. Shrimali, Peter Skilling, K.N. Srivastava, and Cynthia Talbot. Our special thanks go also to those who presented public lectures at the India International Centre during the conference: Romila Thapar, who gave the Keynote Lecture, Gurcharan Das, and Richard Salomon. The conference was attended by a large number of scholars and students. Many of the participants visited Sanchi and its environs, and we want to thank the Archaeological Survey of India for facilitating visits to the archaeological site of the area. Under the leadership of Janice Leoshko and Himanshu Prabha Ray, we also organized a photographic exhibition on Asoka at the India International Centre during the conference, which was later shown at the Nehru Memorial Museum and Library. We want to thank the Center for Art and Archeology of the American Institute of Indian Studies and Oak Bhawan of the Department of Philately at Oak Bhawan for their assistance in organizing this exhibition. Finally, we want to thank Oxford University Press, Delhi, for accepting the publication of the significant but complex and overly long volume. In 1837, James Prinsep was able, after much study, to decipher ancient inscriptions that had been found throughout the subcontinent engraved on rock surfaces or on immense stone pillars. The full significance of this achievement, however, was realized only later in the same year when he learned that the royal title 'Piyadassi' used in the inscriptions was identified in Buddhist chronicles from Sri Lanka with Asoka, an Indian king thought to be a supporter of Buddhism (Kejariwal, 1988). The way in which James Prinsep came to associate Asoka with these inscriptions still significantly colours the general understanding of this ancient Indian king. Scholars since that time frequently combine evidence from textual sources with the inscriptions in order to shed light on the life and activities of Asoka, and since that time, Asoka’s engagement with Buddhism has continued to be a central issue (Smith, 1901; Thapar, 1960). While there remain questions about almost every aspect of his reign, clearly Asoka was a remarkable ruler in ancient India who retained centrality within different traditions of the subcontinent and, perhaps most importantly, came to be associated with the present Republic of India. For my part, I am exceedingly happy that in this sense indirectly we have associated with this Flag of ours not only this emblem but in a sense the name of Asoka, one of the most magnificent names not only in India's history but in world history ... Now because I have mentioned the name of Asoka, I should like you to think that the Asokan period in Indian history was essentially an international period of Indian history. It was not a narrowly national period. It was a period when India's ambassadors went abroad to far countries and went abroad not in the way of an empire and imperialism, but as ambassadors of peace and culture and goodwill (Copal, 1984: 71-2). Therefore, Nehru concluded, the flag was a symbol not of empire or imperialism, but of freedom and peace. The adoption of an ancient symbol by a modern nation is significant, but what is also striking is the twentieth-century reference to Asoka who ruled in the third century BCE. Since James Prinsep's decipherment of the Brahmi script used for Asokan inscriptions, the study of this ancient king has embraced a remarkable array of sources but overwhelmingly these have been textual. The fact that these textual sources, which are not all Indian in origin, date from after the time of Asoka and, as well, may have distinct motives for the information they relate should provoke caution in their use as evidence for Asoka, but this has not always happened. Trautmann and Sinopoli (2002), moreover, argue that a bias still remains towards certain kinds of texts in the study of the past. Thus, the fact that the interesting account of Megasthenes, who was an ambassador at the Mauryan court, is lost, and we know of it only from portions quoted by much later authors, is rarely mentioned when used as evidence of Mauryan times. Nonetheless, real engagement with the material evidence is increasing, and at the same time scholars are further refining their studies of the inscriptions, as well as considering new aspects such as their form and very fabrication in order to comprehend their full significance. While many have contributed to Asokan studies, arguably two scholars who have most valuably defined the field during their long engagement with Asokan material are Romila Thapar and K.R. Norman. Their studies in many ways laid the foundations on which further work now progresses. The chapters in this volume engage in various ways with surviving textual as well as artistic, archaeological, and numismatic evidence in order to assess what we know about Asoka as well as the ways in which he has been imagined. Scholars especially take into account advances made in various fields during the past half century. They also examine the ramifications of prevailing views of Asokan material, such as the recent scholarship that has viewed much of post-Asokan Indian literature, especially the epics and the legal texts, as responses to Asokan reforms. Three aspects may be identified as core themes of many of the chapters, providing unity to the volume. The first is the issue of contexts of the Pillar Edicts and Rock Edicts. Scholars refer to two genres of inscriptions: Those in the first person and those that refer to the king in the third person. The first category includes the two Minor Rock Edicts, all the Pillar Edicts, as well as the four Rock Edicts (3, 5, 6, and 14), the two Separate Edicts, and the minor Pillar Edicts dealing with the Sangha. All the others, including a majority of the Rock Edicts and the Greek and Aramaic texts in the northwest are written in the third person. A distinction is also evident between the Pillar Edicts that open with the statement devanampiye piyadasi laja hevam aha and the Rock Edicts, where there is no such uniformity. The Pillar Edict series appears to be the result of a careful composition. In Pillar Edict 1, dhamma is declared to be an important element of policy, and in the following edicts the king enumerates concrete measures with which he tried to promote the cause of dhamma. While the Kausarnbl Schism Edict (on the pillar now at Allahabad) opens with the words devanampiye anapayati kosambiyam mahamata, these words have been lost in the Sanchi and Sarnath versions. The Pillar Edicts were the last to be engraved and in general they are in the same dialect at all the sites and present a single textual corpus rather than individual separate texts. Here Asoka declares dhamma as an important element of his policy and the basis of good governance and speaks of his concern for the growth of dhamma among his people. Engraved around the twenty-sixth year of Asokas abhiseka, five of the pillars were inscribed, while still in the horizontal position, while this was not the case with the Topra and the Allahabad pillars. As shown by several authors in this volume, the edicts of Asoka were mediated by several layers of editorial, anthologizing, inscriptional, and translation activities. Clearly then the local and regional contexts, as might be evident through archaeological work, can provide crucial clues to an understanding of the edicts. A second theme is the interconnectedness of the edicts. How is this to be understood? Traditionally, scholars have provided the framework of either empire (Sharma, 2005: 177) or trade networks (Ray, 2008: 13-51) as the overarching phenomenon that connected the dots. Perhaps it is time, for instance, to factor in the materiality of inscriptions and their commanding presence. Asoka adopted and propagated very different notions of kingship than those prevalent in an earlier period, both in terms of their content and form. In particular, these resulted in notions of Buddhist kingship that have played a major role in concretizing attitudes towards governance in countries of South and Southeast Asia. 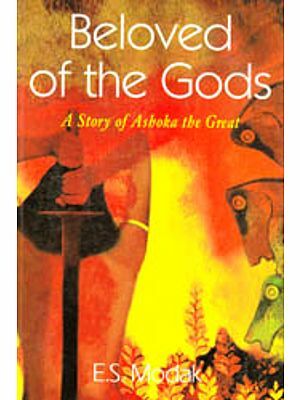 'In Theravada countries such as Sri Lanka, Thailand, Laos and Burma, he [Asoka] was and still is portrayed as a paradigmatic ruler, a model to be proudly recalled and emulated' (Strong, 1983: 39). By contrast in India, knowledge of Asoka had been almost completely lost and even the Brahmi script became unreadable. Beyond issues of verbal content, how is the text on the pillars and rock surfaces to be understood visually? Did the text create its own visual cognisance? How can we understand inscriptions as agents that used monumentality and other characteristics in the crafting of identity? Such questions take us to a third theme, which includes analysing locations of Asokan edicts as sites of memory. For example, many of the pillars and rocks continued to be used well after the third century BCE as later rulers added their own inscriptions, and perhaps even more importantly, sometimes moved them to new locations. Social and cultural developments that led to and supported the formation of Asoka's empire are reflected in surviving archaeological evidence even if we can not always identify remains that date specifically from his reign or even the Maurya dynasty. An overview of surviving archaeological evidence can, however, provide a backdrop in which to situate the evidence studied in this volume, highlighting the importance of context, interconnectedness, and defining characteristics. Historians have tended to credit the Mauryas with an improvement in the material life of the people and have often taken recourse to archaeological evidence, such as the presence of fortified settlements, the use of bricks, the presence of soakage pits or ring wells, introduction of hand-made objects of burnt clay, beads, and punch-marked coins, the use of good quality ceramics, such as the Northern Black Polished Ware (NBPW), weights, widespread use of iron implements, and so on (Allchin, 1995). 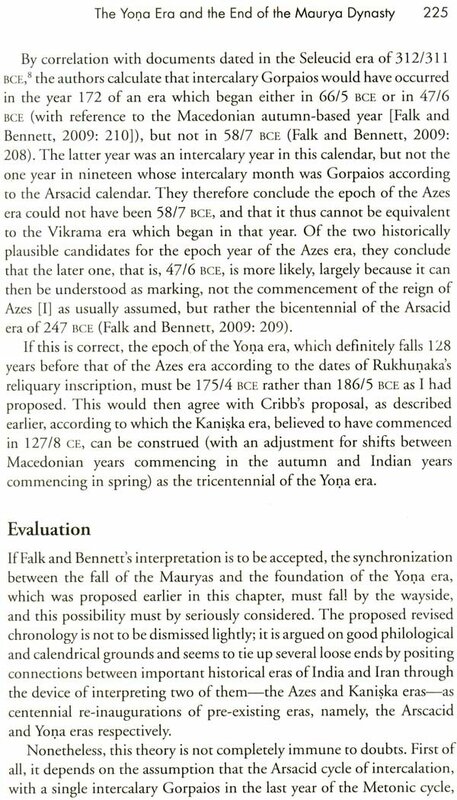 Significantly, none of this evidence dates exclusively to the Mauryan period, that is, from 317-186 BCE, but instead belongs to a larger time-bracket that falls between 550 BCE and 100 BCE. Erdosy dates the NBPW period into early (550-400 BCE), middle (400-250 BCE) and late phases (250-100 BCE) within this larger time bracket (Erdosy, 1995). The archaeological search for the capital of the Mauryas began in the eighteenth century and Major Rennell identified it with the city of Patna in 1783. From 1892 to 1899, Lt. Col. L.A. Waddell excavated many areas around the city of Patna. D.B. Spooner, Superintendent of the Archaeological Survey of India, resumed work at the site of Kumrahar in 1912-13 and located a pillared hall, which he compared to the Achaemenid Hall at Persepolis in Iran. Over the years, digging for roads and sewage pipes in the city have led to a vast collection of terracottas, sculptures, and other archaeological artefacts, bur the context of most of these is missing. The association of the Dharmarajika Stupa at Taxila with Asoka was first suggested by Sir John Marshall after his excavations at Taxila from 1913 to 1934, largely based on the Asokdvaddna dated to the early centuries of the Common Era, which credits Asoka with enshrining the Buddha's ashes in 84,000 sticpas. The earliest occupation at Taxila was identified at Bhir Mound and dated on the basis of the NBPW. The Mauryans are said to have taken control of the site in 321 BCE. In fact, before Asoka became emperor of the Mauryan Empire, he is said to have been appointed 'viceroy' of Tax il a by his father and almost all histories credit Asoka with the introduction of Buddhism to Taxila. Marshall argued that the two small Chunar sandstone objects that he found near the stupa were fragments from an Asokan pillar broken during a revolt in Taxila under Kunala, Asoka's son (Marshall, 1951). Subsequent research has challenged many of these assumptions and it is established that the Dharmarajika Stitpa dates to the post-Mauryan period. The earliest coins found at any of the Buddhist sites in the northwest are those of the Indo-Greek ruler Menander I (155-130 BCE), and these were found at Dharrnarajika Stupa at Taxila. A majority of the coins found at Taxila are the square uninscribed bronze coins of the lion and elephant type dated to the second century BCE. In terms of architecture, the earliest phase at Taxila is dated from 200 BCE to late first century CEo It is at this time that there is evidence for the creation of public sacred areas and temples in and around the city of Sirkap, as also at the Dhamarajika complex where the earliest remains date from this period (Behrendt, 2004: 7). The use of scientific methods of analysis has also opened up new vistas of study, as evident from the results of the Franco-Bangladesh archaeological mission to the site of Mahasthangarh in Bangladesh, which is often seen as the easternmost city established by the Mauryas. The date of the foundation of Mahasthangarh remains one of the puzzling questions. An analysis of the data from the excavations shows that settlement emerged in the late fourth century BCE and expanded largely in the post-Mauryan period. The eleven deep layers of excavations from the foundation of the site to the late second century CE were grouped into three cultural phases: The 'early settlement', the late fourth/early third century-early second century BCE (levels 1---4), the 'Capital City', early second century BCE-mid-first century BCE (levels 5-8), and the 'Pause', mid-first century BCE-second century CE (levels 9-11). The definition of these phases was based first of all on the stratigraphic sequence (succession of layers), then on the structural remains (walls, floors, etc.) and the objects of the material culture. In all cases, radiocarbon dates confirmed the division (Salles, 2004). The excavators have also been able to provide insights into environmental and hydrographic changes in the coastline and shifts in agricultural lands in the region, which made it attractive to the earliest settlers in the fourth/third century BCE.